Ever Wish your Carpets looked like they did when you first got them? Loved Ones and Pets can take a toll on your Carpets & Area Rugs. Our Professional Carpet Cleaning Services can help restore your Carpets to their Former Glory – Making them Soft and Fresh in Look and Feel. 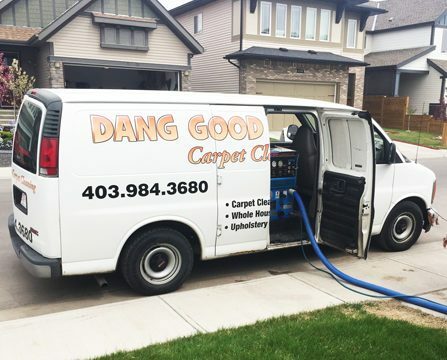 Our Superior Steam Cleaning by Dang Good is the least expensive way to go. We have Unreal Prices for a Top-Notch Clean. Some companies charge way more for the same quality clean. Some companies charge similar prices but the cleaning may be disappointing. Dang Good balances Perfectly Affordable Prices with an Outstanding Cleaning of your Precious Carpets. WAS $99.99 Plus a WDF and GST. NOW our Cheapest Deal is $79.99! *We have Deals to suit all Budgets! Our Cheapest and Most Affordable Carpet Cleaning Package is $79.99 . For this Amazing Price you get a Basic Carpet Clean of Up to 3 Rooms, and one Hall. Maximum Area is 600 Square Feet. *A Basic Clean does not include treatments for Soiling, Stains or Pet issues/Urine Issues which will incur Extra Charges. WAS $149.99 Plus a WDF and GST. NOW Our House Special is $99.99! Up to 5 Rooms and 1 Hall. Maximum Area is 900 Square Feet. Below are the Basic Steps in our Professional Carpet Cleaning Process. Prior to arrival we ask that the carpets be vacuumed. It is important that any dry soiling be removed first before any special treatments are applied. A high pressure steam cleaning is then carried out. A wand is used to simultaneously inject high temperature steam together with powerful suction to both agitate the ground-in dirt and carry out a powerful and deep extraction of the dirt particles embedded in the carpet together with the suction of any excess of water so that carpets do not get too wet. The above is the process for a Basic Standard Carpet Clean. Please see further down for our other treatments. The Basic Carpet Clean is Odour Free. You could even afford to get your Carpets done Twice a Year! With such Unbeatable Prices why not consider using us more than once year? Perhaps in the Spring or Summer and then again in the Fall, before Christmas? Or maybe just after Christmas or New Year? A Professional Steam Cleaning is the best way to remove the dust, dirt and grime that builds up in the Carpet Fibres. It will not only keep your carpets looking consistently good, but it will help preserve them too. A Carpet Cleaning Service is way cheaper than replacing your Carpets each time they get a little tatty. Want to book a Professional Carpet Cleaner that will do a superb job? Then Call Us! Why Waste Your Time, Energy and Money on a Home Carpet Cleaner? Is it really worth renting one of those Home Machines when we charge such a great price for a Professional Steam Clean? We provide cleaning that arguably cannot be matched by you doing it yourself. While we are in your home, perhaps we could also clean your Area Rugs and some of your Upholstery too. Occasionally when you move the furniture around in a room, you get to see just how dirty the carpets really are, especially when the only clean patch is where the piece of furniture used to sit. This carpet could have easily been mistaken for a Navy Blue Carpet but was restored to a clean Royal Blue Coloured Carpet after a Heavy Pre-Treat, a High Pressured Steam Clean and a lot of Hard Work. For a Heavy Pre-Treat we use a much more aggressive product – tough on dirt yet safe on carpets.The product is applied liberally before the carpet cleaning, then the above method is used but with three times more effort. Sometimes Carpets simply haven’t been cleaned in a very long time. As you can see with this customer she was delighted with the results. Of course, you wouldn’t eat off your carpets but your children will play on them and may well eat on them too. Professionally Cleaning your Carpets will give you the peace of mind that they are sparkling clean. For added benefit get them Sanitized too. ​​High Traffic Areas such as Stairs often need a little more TLC but more often than not we can bring them up as good as New. We don’t guarantee stain removal However what we do say is…. If we can’t get it out, its not coming out! We use products such as Microban. Please note these products are not Odour Free although it is safe. If you need Odour Free Products – Please request at the time of booking. For an extra charge, after cleaning, we apply a Topical Spray to the Carpets. We use 3M Scotchgard Carpet and Fabric Protector. We clean Area Rugs at the customer’s home. Area Rug Cleaning is an Add-On Service. For most Rugs the process for cleaning is the same as for Carpet Cleaning. However we do not clean Persian or Silk Rugs and some Wool Rugs as those require specialist cleaning. We have companies we recommend for that so feel free to give us a call. We will not clean rugs on hardwood or laminate floors. They can be moved and cleaned on carpet or on a tile floor and they will need to be placed in an area of the home where they can be left to dry. There are also options for Deodorization, Stain Removal and Fabric Protection. Please see our Contact Page for our current Add-On Prices. We use Modern Powerful Truck-mounted Equipment. For a showcase of our Carpet Cleaning take a look at the following YouTube Video. We are Trusted Caring Professionals…..
We are also accredited with the BBB (Better Business Bureau). And… our Reviews speak for themselves. Looking for Affordable Prices? Check out our Carpet Cleaning Offers/Deals here. Click Below for our Upholstery Cleaning.